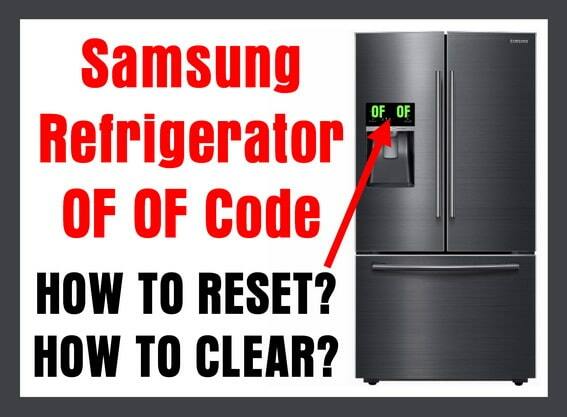 Samsung Refrigerator OF OF Code On Display – How To Clear? What does OF OF mean on a Samsung refrigerator? The Samsung fridge OF OF code means the refrigerator is in Display Mode, Demo Mode, or Showroom Mode. 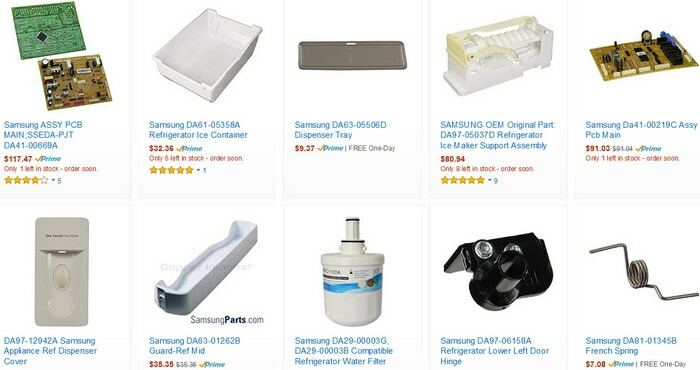 These modes are meant for displaying the appliance in a store or showroom, such as on the showroom floor at Home Depot, Lowe’s, Best Buy, etc. This “Showroom Mode” is incorporated into all Samsung refrigerators with a digital display panel. 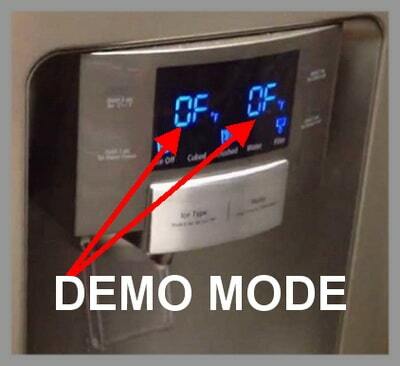 The OF OF code is meant to not let the compressor run when the refrigerator is being displayed for demo purposes. If the Samsung refrigerator is in Showroom Mode, the interior lights and the display panel will illuminate, but the compressor will not run. This is done purposefully so the compressor does not run when the fridge is displayed at a store or on a showroom floor. This lets the refrigerator be displayed with all the lights working, but no cooling taking place. You will also notice that the ice maker and water dispenser will not work. When the OF OF code is shown, the fridge is not cooling. 1 – Press the POWER FREEZE and the FREEZER buttons at same time. 2 – Hold the 2 buttons for 3 to 5 seconds. 3 – This will reset the refrigerator back to normal and the fridge will begin cooling again. -Press the ENERGY SAVER and the POWER FREEZER buttons until you hear an audible beep. – Hold the 2 buttons for 3 to 5 seconds or until you hear a bell sound. – This will reset the refrigerator back to normal and the fridge will begin cooling again. 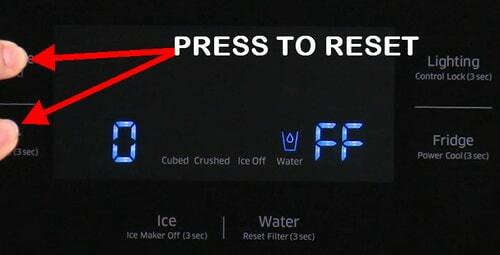 Press and hold the EXPRESS FREEZE and REFRIGERATOR TEMP CONTROL buttons simultaneously for 3 to 5 seconds. Press and hold the LIGHTING and FREEZER buttons simultaneously for 3 to 5 seconds. Press and hold the POWER FREEZE and FREEZER buttons simultaneously for 5 to 10 seconds. Press and hold the HOME and HELP buttons simultaneously for 3 to 5 seconds. Open fridge door, press and hold the ICE PLUS ULTRA ICE and REFRIGERATOR TEMP buttons simultaneously for 3 to 5 seconds. Press and hold the ICE PLUS ULTRA ICE and UP DOWN buttons simultaneously for 3 to 5 seconds. Have questions concerning a Samsung refrigerator with the OF OFF code or how to reset the display panel? Please leave your question below and we will be happy to assist you. Can you please let me know what is wrong or if I can reset it? Thank you! I used the chat-line type help that Samsung has but they couldn’t help me. This site had me press a different combination and it worked! The freezer button and power freeze won’t light up to reset. Thank you! The demo setting somehow got switched on today and I couldn’t figure out what on earth was wrong, as this isn’t in the manual. What a ridiculous “feature” to include in the easily-accessed door panel! I have five small kids and who knows if it was one of them or someone accidentally leaning on the panel who turned on the display mode. You shouldn’t be able to turn your fridge off (and yet have it appear to be working) so easily! Fridge is displaying OF, according what I am reading, this means it is set in demo mode, tried all options to reset and it is not working, any advice? Fridge model # is rs265tdbp. OF OF codes won’t clear. Oh my gosh thank you. I thought I had broken my fridge after resting my hand on the display to long. My refrigerator shows the Of Of code and after I reset by holding power freeze and energy saver the screen shows 0 0 and after it shows those numbers for a bit it goes back to showing Of Of. I am not sure what to do after that. I reset and it’s working but what caused it to do that in the 1st place? I don’t want it happening again since things started to thaw before I noticed it. I have a Samsung mdl# RFG296HDWP/CAN. While trying to set a forced defrost I lost the lighted display. How do I reset the display? I had The two codes OFOF and it reset where the codes went away but the compressor is not running. Please advise. I have tried all the methods described on this site and the error code won’t clear. The ice maker and water dispenser still seem to be working though. In pressed the power freeze and freeze button down on my Samsung refrigerator and I heard the compressor start but every time I try to set the temps it goes back to what it was displaying at first 77 degrees. I have a Samsung model RF26XAEWP, THAT WILL NOT STOP BEEPING. THE ENERGY SAVER ICON BLINKS ON AND OFF AND BEEPS CONTANTLY. DRIVING ME CRAZY HELP!! I have a Samsung model RS265TDBP and the OF OF error code is displayed. I tried holding buttons down but not working. I did the reset heard the compressor kick on for about 6 secs, now I cant hear it running, but it is no longer displaying the OF it is actually showing nothing now. Is it a matter of waiting? Previous post: Dishwasher Door Will Not Close or Latch – How To Fix? Next post: What Is The Best Way To Fix A Squeaky Door Hinge?